Micrometals T50-3 Toroid, material 3, Carbonyl HP, 20kHz to 1MHz, AL= 175uH 100 turns..
32MHz Microprocessor Crystal, Fundamental 25deg C QC49S, 18pF Load C,&nb..
Mini-Circuits MAR-4 ( DC - 1GHz ) monolithic amplifier 50ohm, micro..
AD9958BCPZ, CMOS, 2 channel 10 Bit 500MHz Direct Digital Synthesizer with ind..
MAX2606EUT 70 to 150MHz Voltage Controlled Oscillator, suitable as an IF conversion ..
LMX2330L Low Power Dual Frequency Synthesizer, 2.5GHz / 510MHz. Integrated d..
Motorola MC13135P dual conversion FM narrowband receiver with onboard voltage cont.. 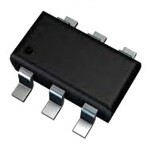 The MAX2754EUA is a 1145 to 1300MHz Voltage Controlled Oscillator in a very t..